Nocturne and Dance was commissioned by David Childs and was written in November and December 2012, receiving its first performance by Childs and Christopher Williams on 13 October 2013 during a recital at Cardiff University’s Concert Hall, forming part of the Arcomis International Brass Event. 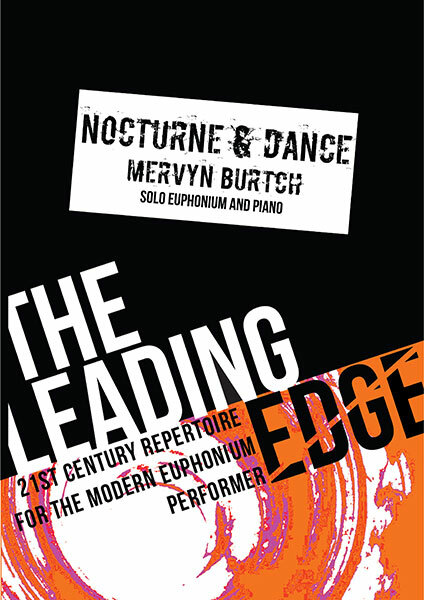 The Nocturne (A Dream) opens with a slow, quiet, and rather menacing slow march on the piano, while the euphonium has a quieter and less aggressive role. Tension rises as the music for both instruments becomes more agitated, faster, and louder. Whatever the dream is, it is increasingly disturbing until the sleeper awakes and the tension subsides. The opening music now returns, but the menace is held in check; the nocturne fades away. The Dance, by contrast, is a much more extroverted movement with each instrument playing off rhythmically against the other in a texture that becomes more and more complex, leading eventually to a final flourish bringing reconciliation between the two instruments. This article was posted in New Releases, Sheet Music and tagged euphonium, Leading Edge Series, Mervyn Burtch, piano, sheet music on 21 May 2015 .